Persimmons will always make me think of my friend Courtney - she earned the nickname "Miss Persimmon" by the owners of one of the Minneapolis Asian grocery stores because once the fruits came in season, she would buy them by the case she loved them so much! Courtney, you'll have to make a couple of adjustments to make this salad vegan, but it will showcase your favorite fruit no matter what. Here's to Miss Persimmon, and this delicious salad! Make the pickled shallots: combine 1/3 c apple cider vinegar, 1/2 tsp honey, shallot, and a pinch of kosher salt; toss well to combine. Let sit for 10 minutes until shallots are pickled; drain and reserve shallot. 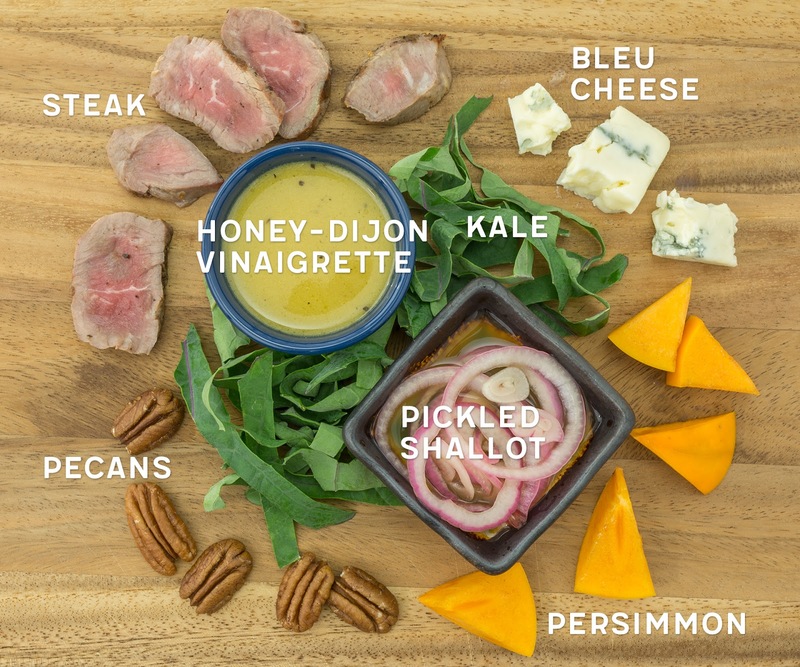 Make the honey-dijon vinaigrette: combine the remaining 1/3 c vinegar, 1 tsp honey, dijon, olive oil, and salt and pepper to taste in a pint-sized mason jar or other tall container. Puree and emulsify the dressing using a handheld stick blender. 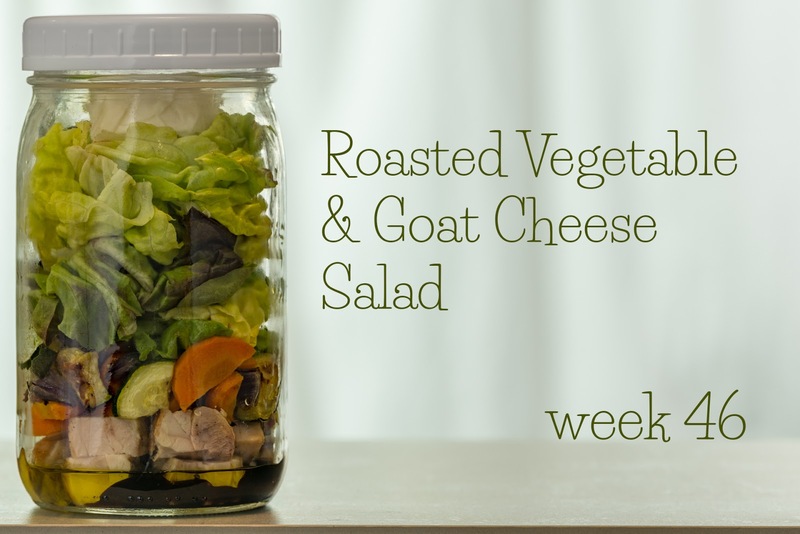 Pack the salads: divide the vinaigrette evenly between each of 4 tall quart-sized containers. 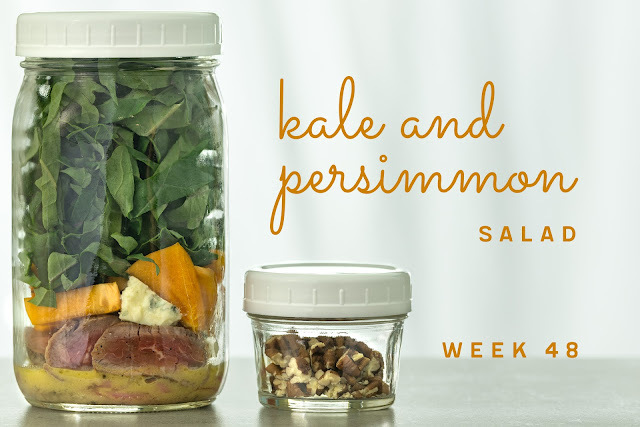 Layer the pickled shallot, steak, bleu cheese, persimmon, and kale in the jars. Divide the pecans evenly between 4 2-oz jars or snack-size zip-top bags for each salad. Refrigerate until serving. TIME-SAVING TIPS: Use your favorite store-bought vinaigrette and croutons in place of the homemade vinaigrette. Use bagged baby kale in place of the shredded kale. SPECIAL DIET SWAPS: For a vegetarian salad, omit the steak. For a vegan salad, also substitute agave nectar for the honey in the dressing and your favorite non-dairy bleu cheese or feta crumbles for the dairy cheese. For a nut-free salad, substitute sunflower seeds for the pecans. This salad is gluten-free as-is. I hope you all have enjoyed time to relax and feast with friends and family this week! Last week's salad appears late, for two reasons: 1. I was busy cooking last week (we hosted 11 for Thanksgiving this year, and roasted our first turkey!) and 2. I thought you might like a salad recipe that could use up some leftover turkey. 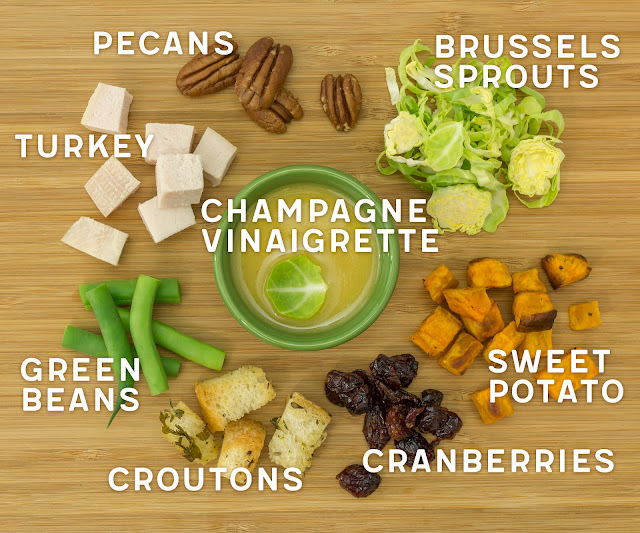 This salad is a fresher, crisper, lighter take on traditional Thanksgiving fare - turkey, sweet potatoes, green beans, cranberries, brussels sprouts, pecans, and sage-seasoned croutons, drizzled with a bright champagne vinaigrette. Happy belated Thanksgiving! Make the champagne vinaigrette: combine the garlic, mustard, vinegar, lemon juice, honey, salt, pepper, and 1/2 c oil in a pint-sized mason jar or other tall container. Puree and emulsify the dressing using a handheld stick blender. Make the croutons: preheat the oven to 425 degrees Fahrenheit. Toss the bread cubes with the remaining 2 tbsp oil, salt, 1/4 tsp pepper, sage, thyme, parsley, and garlic. Bake the croutons for 10 - 15 minutes, or until evenly dried and golden brown. Cool. 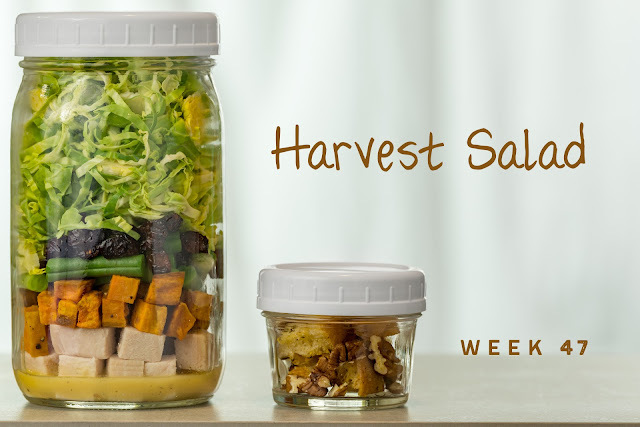 Pack the salads: add 2 tbsp dressing to each of 4 tall quart-sized containers; reserve the remaining dressing for another use. Layer the turkey, roasted sweet potato, green beans, dried cranberries, and brussels sprouts in the jars. Divide the pecans and croutons evenly between 4 snack-size zip-top bags for each salad. Refrigerate until serving. Enjoy your salad: invert your salad onto a plate or into a bowl. Top with croutons and pecans. TIME-SAVING TIPS: Use your favorite store-bought champagne vinaigrette and croutons in place of the homemade dressing and homemade croutons. Used frozen green beans, thawed and patted dry, in place of the steamed green beans. Use pre-shredded, bagged brussels sprouts or baby kale in place of the freshly-shredded sprouts. SPECIAL DIET SWAPS: For a vegetarian/vegan salad, substitute agave for the honey in the dressing, and your favorite mock turkey product for the cooked turkey. For a nut-free salad, substitute pepitas for the pecans. For a gluten-free salad, omit the croutons or substitute your favorite gluten-free bread for the baguette in the homemade croutons. T'is the season for roasted vegetables - any combination of veggies, tossed lightly with oil and roasted in a hot oven until tender and beginning to brown seems to make the perfect side dish to any supper this time of year, a delicious breakfast alongside a couple of fried eggs, or a satisfying salad topping! The carrot, zucchini, and red onion called for in this recipe are really only suggestions - choose whatever veggies you like best! Roast the vegetables: toss the carrot, zucchini, and red onion with 1 tbsp olive oil; season with salt and pepper. Roast veggies on a sheet pan at 450 degrees Fahrenheit for about 20 minutes, or until they are tender and browned. Cool. Pack the salads: add 1 tbsp olive oil and 1 tbsp vinegar to each of 4 tall quart-sized containers; season with salt and pepper. 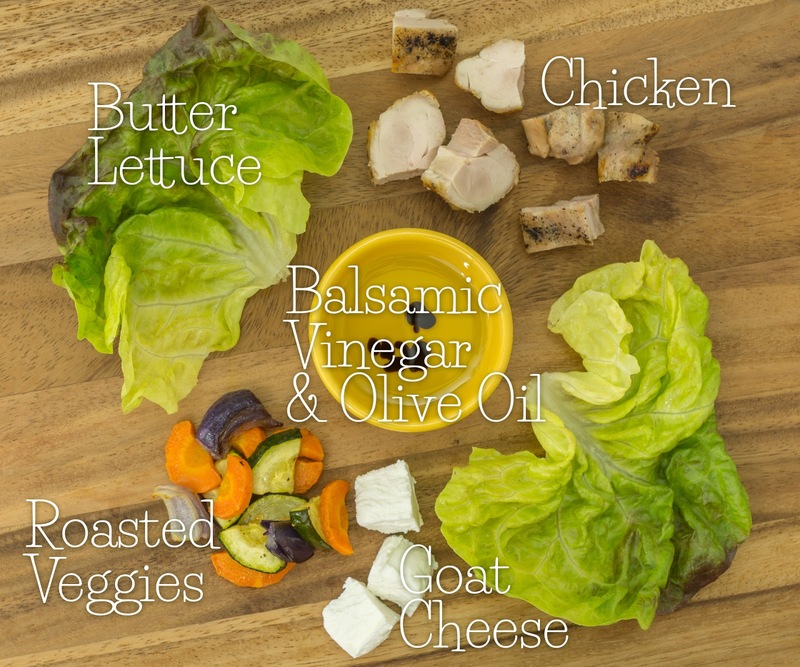 Layer the chicken, roasted vegetables, and butter lettuce in the jars. Add 1 goat cheese round to each jar. Refrigerate until serving. Enjoy your salad: invert your salad onto a plate or into a bowl. Top with goat cheese. TIME-SAVING TIPS: Use store-bought roasted vegetables from the deli counter instead of making homemade roasted vegetables. SPECIAL DIET SWAPS: This salad is gluten- and nut-free as-is. For a vegetarian salad, omit the chicken. For a vegan salad, substitute 14 oz extra-firm tofu, seasoned and grilled or broiled, for the chicken and goat cheese. 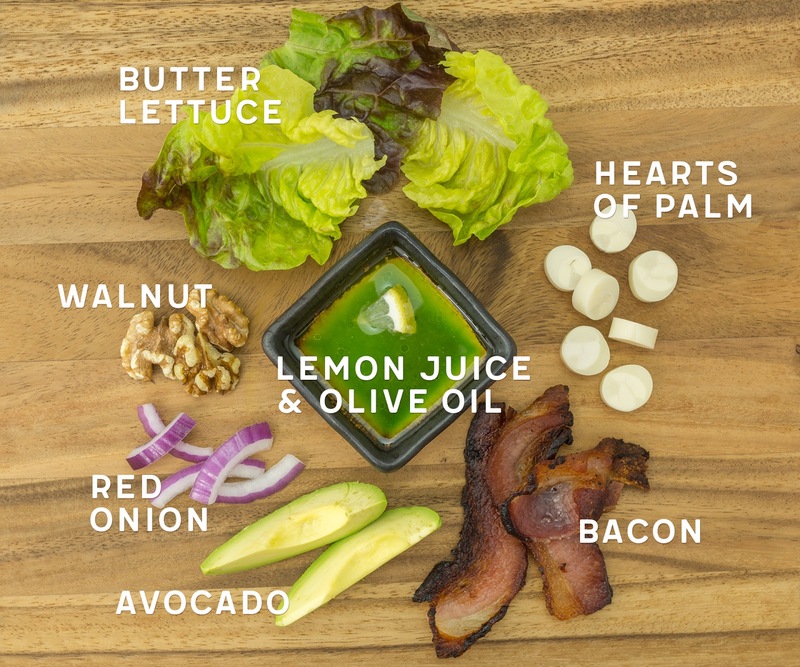 I first had a version of this salad at a local restaurant with a few friends, and was reminded of how much I like hearts of palm. They pair beautifully with avocado, and lend something altogether special to this week's salad - a couple of "decadent" ingredients all packed up and ready for healthy lunches! Pack the salads: add 1 tbsp each lemon juice and olive oil to each of 4 tall quart-sized containers; season with salt and pepper. 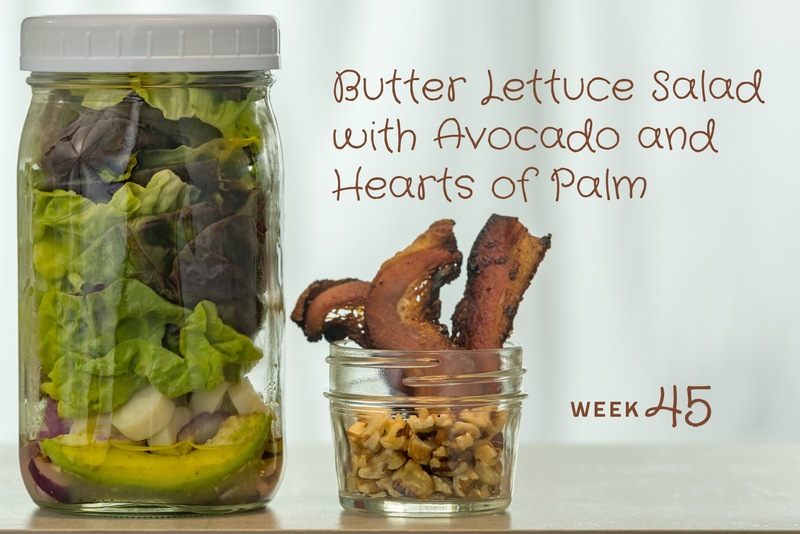 Layer the avocado, onion, hearts of palm, and butter lettuce in the jars. Divide the walnuts and bacon crumbles evenly between 4 2-oz jars or snack-size zip-top bags for each salad. Refrigerate until serving. Enjoy your salad: invert your salad onto a plate or into a bowl. Top with walnuts and bacon. TIME-SAVING TIPS: Use bottled lemon juice instead of the freshly-squeezed juice. SPECIAL DIET SWAPS: This salad is gluten-free as-is. For a vegetarian/vegan salad, substitute tempeh bacon, your favorite prepared mock bacon product, or smoked almonds for the bacon. For a nut-free salad, substitute sunflower seeds for the walnuts.